I received a nice comment on my blog from Anna last week. I headed over to her blog, And Everything Nice, and was instantly struck by how adorable it was. It’s clean and fresh, but still feminine with some vintage details. My favorite thing about this design is the color scheme. It’s so simple. One bright and charming color and shades of gray. The pink is prominent but used sparingly. I think strategy makes everything look uniform and cohesive. I love the fonts used one this site. I am head over heels for the calligraphy font used on the header and the menu (I believe it’s Carolyna Pro? I die.) The calligraphy font makes everything vintage and whimsical, and then the simple and bold fonts used as accents which helps everything look clean and modern. Perfect. Make sure you head on over to And Everything Nice to check out the prettiness for yourself! Really liked this design! Especially the font! Isn’t is so pretty? She did such a good job! Very very pretty! I too love the font and how she used simple stitches to really bring her header out more. YAY!! I absolutely adore Anna and her blog!! 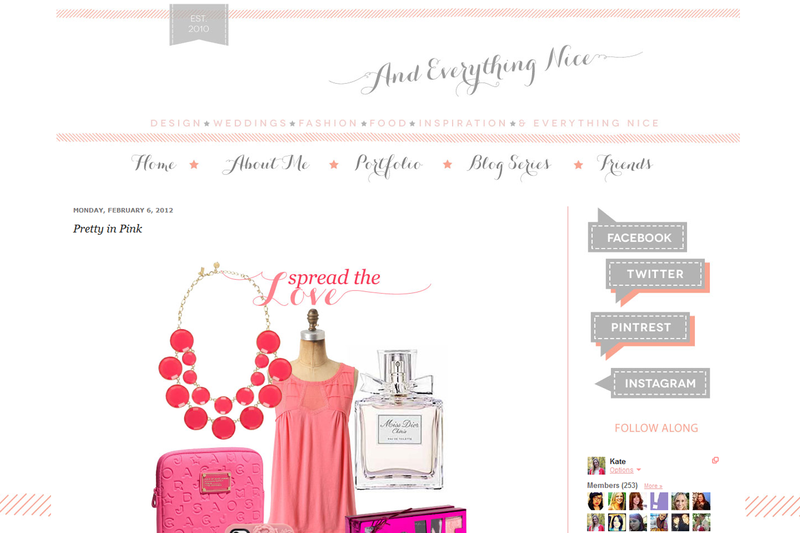 I love everything about her new design… the fonts and colors have me smitten for sure! Me too, I had the post all planned out and then I retook the screenshot this morning because I thought that her post today was just too cute to pass up! It was my pleasure, Anna! You did a fabulous job on your design!